Early Spring on the Kancamangus Highway. I upgraded my bike from a Heritage Classic two years ago for my virgin trip to Sturgis. Since then I have logged almost 30K miles on this beauty. Harley Davidson makes great motorcycles, and ladies don't ever let anyone tell you, you can't ride a big bike. I'm 5'6" tall and weigh 150 lbs. Ride on! 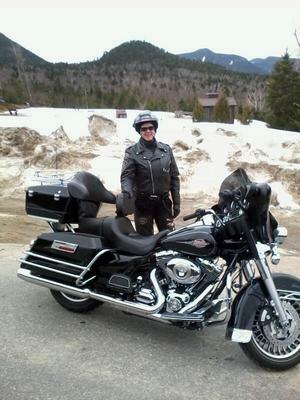 Love the HD bikes--I ride a road king and just love it. I put 10K miles in the past 6 months on the king and wish I could ride more. The king is my second bike and I do recommend a smaller bike for beginners. I started out on a 800cc suzuki C50 and loved it too. I just recently passed my MSF safety course and currently looking for a bike. I want to buy one time only and want it to last. I don't believe in someone suggesting what type of bike i should buy based on their experience, I want to buy based on my comfort level and the confidence that i can handle a larger bike. Thank you.